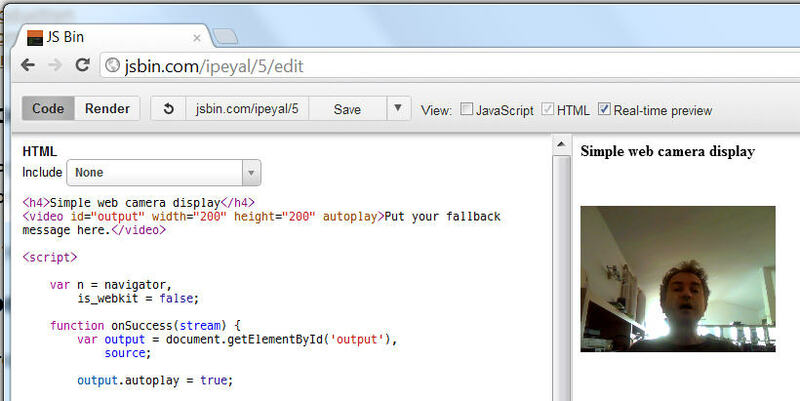 This API enables audio/video capture using a webcam or microphone. Only beta implementations exists in Opera and Chrome, unfortunately not in the stable versions commonly available. Works on Linux, Mac, Windows. Canary build also supports video streaming as well as the brand new Sound API, you can get this version if you prefer. Get it from : http://www.chromium.org/getting-involved/dev-channel. open chrome://flags in Chrome, look for MediaStream and activate it ! There is nothing to activate. Video capture works well, but in the multi-pariticipant Paint program we developped we managed to crash this builds several time when we tried to transfert the video snapshots over WebSockets. However, you may try it anyway.